If you take a champion stallion and the best mare of the year, make the sire a Bundeschampion and produce a new stallion champion and Bundeschampion, the result is Cosmo Royale. After he became Bundeschampion as a three-year-old he was also named "Bundessiegerhenst" making him the young stallion champion for Germany. He won the qualification with a mark of 9.1. Amazingly, none of his individual marks were under 9.0. In the final, the handsome dark sorrel astonished the judges again and received a 9.5 for trot and canter! Sire Cosmopolitan became stallion champion of the Westphalian pony licensing and Bundeschampion of the three-year-old stallions. He received the title "Westphalian Champion" three times, became vice Bundeschampion of the six-year-old riding ponys and World Champion of the dressage ponys in the same year. Since he was seven years of age, Cosmpolitan has placed consistently in international pony classes. At national events, he is succesful with his young rider Lena Bücker at many championships. His offspring are also very impressive. With his debut group, he became the best sire of the three-year-old ponys at the Bundeschampionat. Next to Cosmo Royale, seven more stallions were licensed, three of them received a premium. His daughters represent their sire as well. His daughter Caramba WE became vice winner of the elite mare show, vice Bundeschampion of the three-year-olds and National Mare Champion. The dam state premium mare Cascada Royale became champion mare at the elite mare show in Lienen, won her mare performance test with 8.55 and placed third at the Bundeschampionat. At this time, she was already in foal with Cosmo Royale. Dam sire Casino Royale became Bundeschampion twice and is successful in dressage shows at medium level. He brought 21 licensed stallions and 15 state premium mares. Furthermore, he combines with FS Champion de Luxe, whom Cosmo Royale is inbred to, and Top Nonstop two very imprinting stallions of the pony breeding. Cosmo Royale at the stallion show on 09/02/2019. 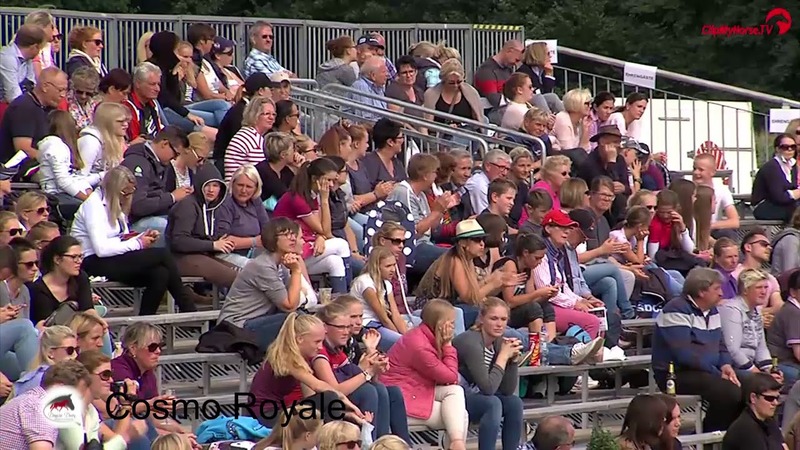 Cosmo Royale at the Bundeschampionat.